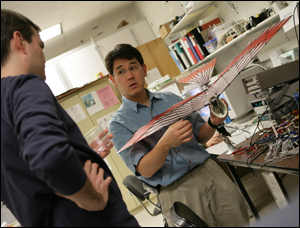 Dr. Horiuchi explains the workings of a micro-air vehicle to one of his students. Noah Shachtman, who edits Wired magazine's online "Danger Room" national security blog, has discovered the research of Associate Professor Timothy Horiuchi (ECE/ISR). Shachtman writes about Horiuchi's work that uses principles from bat echolocation to help micro-air vehicles sense their environment. Read the article at Wired's web site.